Pure comfort food from my childhood. This recipe comes from my Grandmother who was raised on a dairy farm in south-central Pennsylvania. 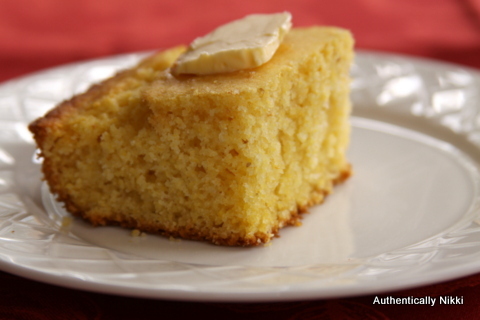 The cornbread has a cake-like texture and is lightly sweet. It is the perfect accompaniment to a spicy chili to a hearty black bean soup. Preheat oven to 400 degrees. Grease an 8-inch square baking pan with cooking spray. In a large bowl, whisk together the flour, cornmeal, sugar, baking powder and salt. Add the milk, oil and egg. Mix just until combined. The batter will be lumpy. Pour into the prepared baking pan and bake for 20-25 minutes until golden brown and a tester comes out clean. Cool the cornbread in the pan for 10 minutes. Cut into the desired number of pieces and serve with butter. Makes 9-12 servings depending on how you slice it up. This entry was posted in Muffins and Quick Breads and tagged cornbread by authenticallynikki. Bookmark the permalink.